I am sorry, NOLA, but I was so disappointed when I saw what New Orleanians call a King Cake (or Kings Cake, or King’s Cake). My first thought: it was a perfectly nice yeast bread hopped up on sugar and decorated by a kindergarten Jackson Pollock. To be fair to New Orleans, my expectations had been set high. I had my first taste of the French Kings Cake - Galette des Rois - in Paris one Twelfth Night many years ago. 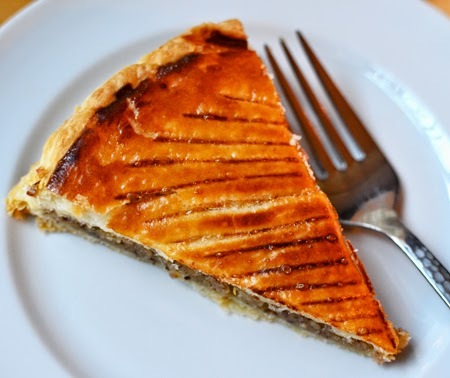 That galette, purchased from a minuscule bakery in the Marais, set the gold standard. That was a Kings Cake to remember. Looking at the two different cakes, they aren't even remotely similar, starting with the timing. 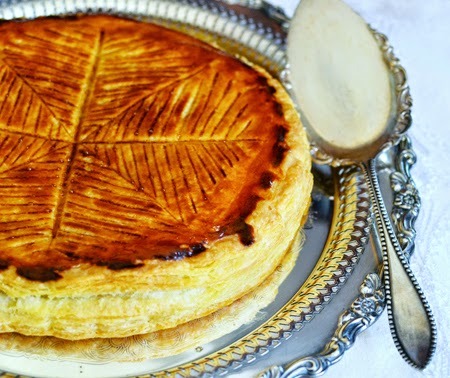 The galette in France is served for the feast of the Epiphany or through the twelve days of Christmas leading up to Epiphany, while the King Cake in New Orleans is baked and eaten from the start of Epiphany through its end on Mardi Gras, the eve of the Lenten season. One charming folk story has it that the galette was baked to woo the three kings (which explains why it is plural - kings cake and Galette des Rois) to visit the baby Jesus, thus the association of the cake with Epiphany, the January 6 holy day that commemorates the Magi’s adoration of the infant Jesus. Who knows what baked goods the three kings might have encountered two millennia ago, but, happily, the French took matters in hand, and gave us an exquisite tradition of a buttery puffed pastry filled with frangipane. By contrast, the kings of the New Orleans Mardi Gras get an eggy yeast bread, glopped with sugary green, purple, and yellow icing further topped with sugar sprinkles in the same lurid colors. A note from Markipedia: The Rex Krewe chose these as their colors in the late 19th century, and somewhere along the way the colors were endowed with the symbolism of purple for justice, green for faith, and gold for power. The one common factor between the French and New Orleanian kings cakes is the fève. Hidden in both cakes is a charm - a tiny doll, a coin, or a dried bean (fève). 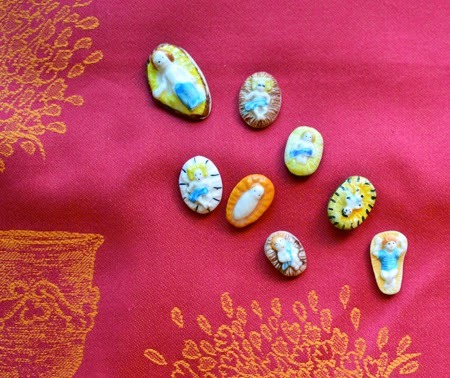 The fève is meant to represent the baby Jesus. Often a tiny doll, in modern day France the fève can even be a cartoon character (I have seem hundreds of Astérix characters for sale online!). I found the fèves pictured above at Maiden France Vintage, owned by Stephanie Hill. If you are the lucky one who gets the fève in your slice of Galette des Rois, your head is crowned (a paper crown!) and you are also expected to buy (or make) the next year’s cake. If you get the fève in NOLA, it is your job to throw the next party. Depending on the situation, that could be as soon as that same evening, the next night, a few days hence, or the following year. For this Galette des Rois, I made my own puff pastry (recipe below) but you can use store-bought, all-butter puff pastry with wonderful results. The frangipane filling is what makes this galette so special for me - the combination of the almond, vanilla and lemon extracts is perfect. 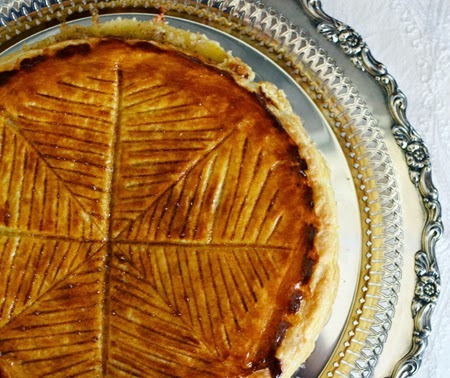 A Galette des Rois is a spectacular dessert, and not terribly difficult to make. And you will have such fun searching for the perfect fève to hide inside! 1 fève– a dried fava bean (fève), ceramic or glass toy doll, etc. 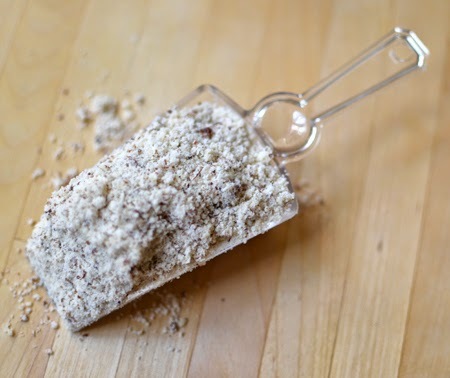 Combine the almonds, sugar, butter, whole egg, and extracts in the food processor. This is the frangipane; it should be the consistency of a thick paste. 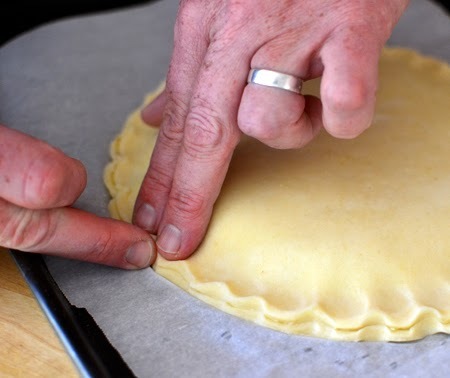 Divide the pastry into two pieces. 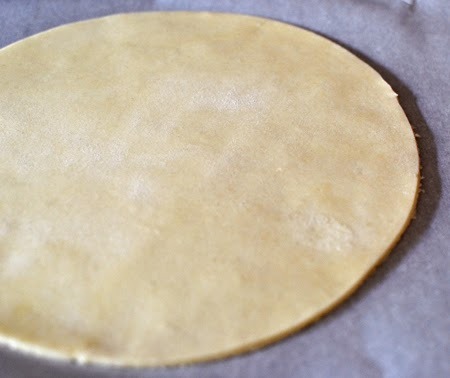 Roll out each piece of pastry and cut into a circle about 10 inches wide and 1/8-inch thick (use a plate or cake pan as your template, being careful not to press down on the dough. 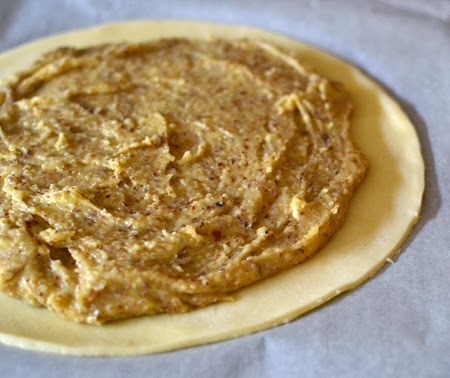 Place both circles of dough on parchment and refrigerate for 10 minutes. 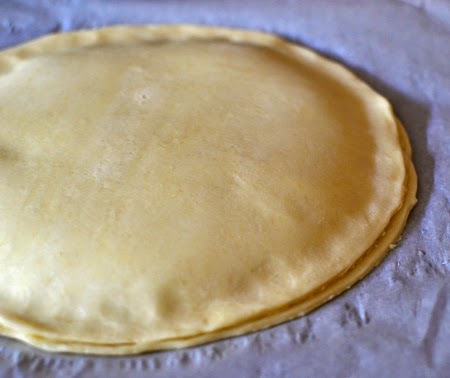 Put one circle of pastry (and its parchment) on baking tray and spread the frangipane evenly, leaving a 3/4-inch border. 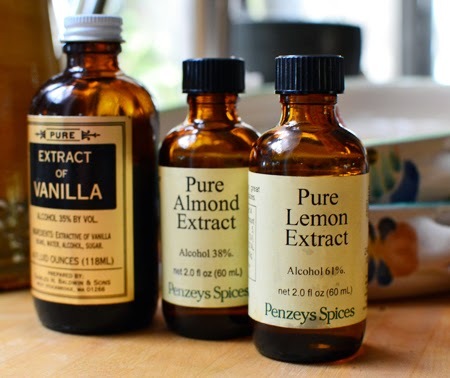 Press the trinket into the paste and cover with frangipane. Using a pastry brush, “paint” the 3/4-inch border with water. 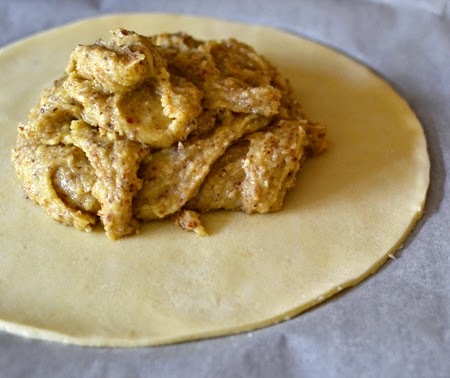 Mix the egg yolk with the milk and brush the entire top of the galette with this mixture, being careful that it stays on top and doesn’t touch any of the sides. (It might keep the sides from puffing up.) 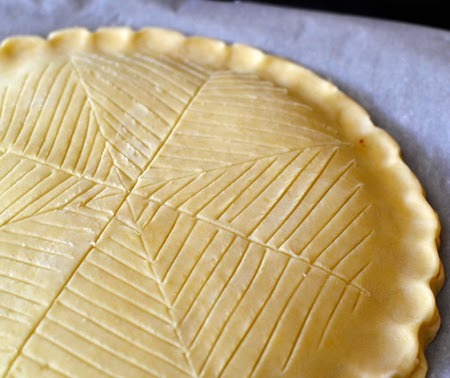 Using a very sharp knife, decorate the top of the galette with patterns of slashes, being careful not to go all the way through to the frangipane. Bake on bottom rack for about 30 minutes, but keep an eye on it. It should be golden with tinges of brown. Serve warm. Put flours and salt in the bowl of the food processor fitted with the steel blade. Pulse a few times to mix. Scatter butter on top of flour, and using on/off button, pulse until butter is the size of lima beans, no smaller than peas. Add almost all of the ice water and 12-15 times. If it’s too dry add the rest of the water and pulse until the dough almost comes together. Don´t let it form a ball of dough; don't over process. 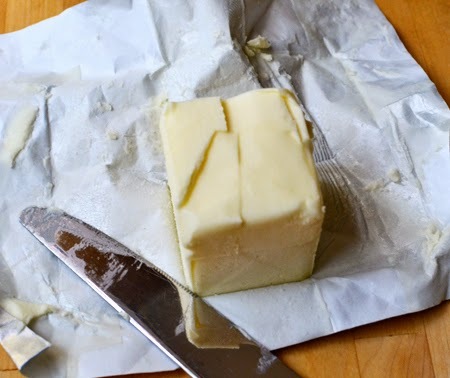 Dump out the dough onto a generously floured work surface and pat it into an 8-inch square. 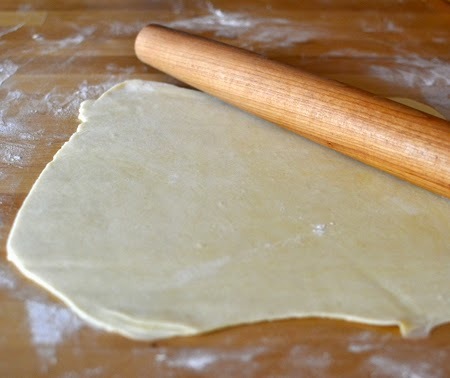 Using a rolling pin, roll out the dough into a rectangle, about 8-inches by 15- to 18-inches. (This will look like an absolute mess in the beginning! Don't worry - it will come together!) Flour the dough and rolling pin as needed to prevent sticking. 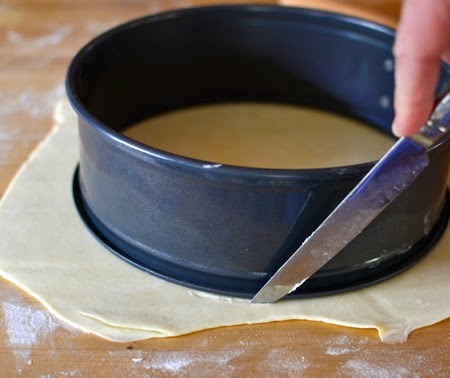 Make the first turn: with the aid of a dough scraper, lift one third of the dough, and flip it down onto the middle third. 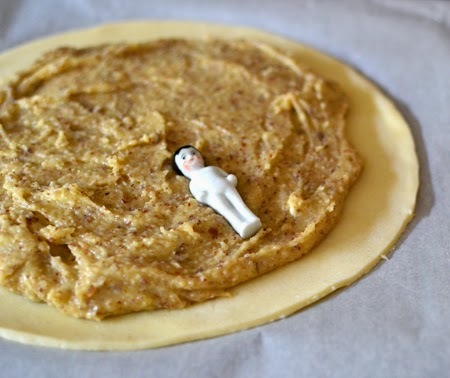 Do the same starting from the bottom with the remaining third of dough. (People describe this as a business letter fold.) Turn the dough a quarter turn clockwise, so that the short side is parallel to the working surface and the long side with the opening is on your right side. Repeat the rolling into a rectangle, the folding in three and turn to the right another three times for a total of four times. Repeat the rolling, folding, and turning of the dough two more times, for a total will be six turns. The pastry needs to be refrigerated for at least 1 more hour before using it. Thanks, Greg - you always know exactly what to say! Beautiful! I must find some kings to invite!! Markipedia suggest you invite the king(s) of your heart, Susan! I also loved learning about the kings cake in NOLA. 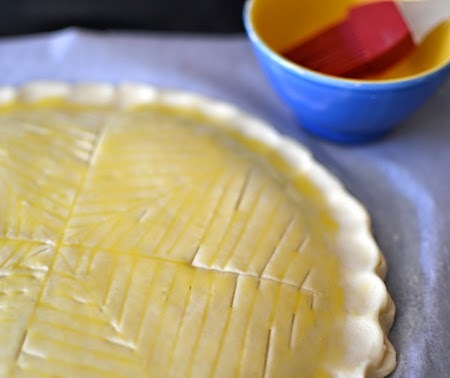 Although my galette has NEVER looked as pretty as yours, I will keep trying -- will use your recipe this time! Isn't it great when a dessert can be really pretty simple and the look so impressive? Thanks, Liz! David, this is one beautiful galette. And a lovely post! Thanks, Mimi! It was fun to make and write! Gorgeous! And perfect timing as we were just talking about the difference between the two versions at Christmas. You answered our questions. We've enjoyed many a Kings Cake from a local French bakery to celebrate the Epiphany. Lucky you, Nicole! Our local French bakery doesn't make these! The Galette de Rois was the cake I was familiar with as the Kings Cake. Then I saw what the U.S. offered!! They are just awful, they don't even taste good and look even worse. Like you, I love the frangipane filling and of course, the puff pastry. I often wondered why they picked those colours so it's nice to know now! Thanks Mark!! Have a wonderful New Years, guys!! Look forward to seeing more wonderful posts from you. Glad Markipedia was able to help! Happy New Year! I agree, I always wondered who created that NOT at all delicious purple and green bready looking thing I have seen around Mardi Gras. Sorry, but I am a member of the "food should taste delicious or it's not worth eating" crowd. I feel the same about lots of Christmas cookies. They're either cute or tasty, rarely both. Caterina - we are both in the same choir when it comes to food needing to be good, or it's not worth eating! Christmas cookies are a big disappointment to me, too. For the first time this year, we were given cookies by a German neighbor - they were all wonderful! But that is definitely rare! Well, what can I say, the French know their pastry. And it sounds so much better in French! I don't actually remember seeing this cake when we were in NOLA. Have a fab NY guys! John - you didn't miss ANYthing by not seeing this cake in NOLA. At least IMHO... (which is getting less humble each day.) Happy new Year to you both, as well. Looking forward to ringing in the New Year at Paris time (3pm here) and then watching movies till bedtime. This version of puff pastry is quite simple and makes a great end product. I think you will like it, Valentina! And back at you - I look forward to lots of fun creativity in 2015. Happy new Year! Thanks, Karen! I wish you lived closer, too - there are a few treats you've made that I wouldn't mind sampling, as well! Wow David! Very impressive and beautiful! I actually make the NOLA version every year! It happens to be a hit with my family and friends…but your French version is so elegant! I love the almond filling, as well! Wishing you and Mark a very Happy New Year! A VERY VERY HAPPY NEW YEAR DAVID!!! My warmest wishes to you both, too, for a happy, healthy and tasty New Year! Thanks for all your lovely comments throughout the year, Rakesh and Swikruti! Hi David, what a master piece you have created here, love the story behind this recipe. Happy New Year! Thanks, Cheri! It was fun to make. Hope you are stayin warm; it is freezing here! This was a really interesting post about a subject I thought I knew all about...but I learned a few things here! As always, loved the photos, too! We are going to make the galette today! Thanks, Susan - your galette looked perfect, AND I am so glad you got the fève on Epiphany! As you know, we made this galette for the Epiphany. I just wanted to add that it was delicious and couldn't have been simpler. It even LOOKED pretty good, as you so kindly said about the photo! Thanks for letting everyone out there know that it really IS simple! No one seems to hae believed me! Yours was quite lovely. I'm so impressed, but I truly shouldn't be! Why would I expect anything less from you! This is truly stunning and of course your own puff pastry would make it over the top! Standing ovation, and I agree, this cake is heads and shoulders over NOLAs version! You are so sweet, Christina! There were a few friends who took me to task, telling me I'd never had a real NOLA kings cake. Still, while that may be true, my French blood tells me that this is the galette for me!